Upper Black Eddy has its origins from the Black family who operated a hotel at there and shares part of its name with the former village of Lower Black Eddy, now known as Point Pleasant. Most of this village’s growth in the early 19th century was due to the opening of the Delaware Canal. As a result, canal-related businesses sprung up quickly, including a shipyard, mule stables, general store and several hotels. Upper Black Eddy also has two notable geographic features. The first is Ringing Rocks Park, a 4 acre boulder field of Diabase rocks, which “ring” like a bell when struck with a hammer. 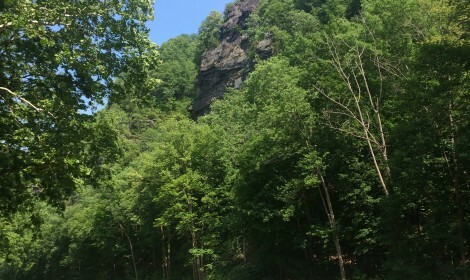 This park also includes Buck County’s highest waterfall situated on High Rocks Creek. The second is Nockamixon Cliffs, a 400 foot wall of shale overlooking the Delaware River that is located within the Delaware Canal State Park.